Oak Meadow is an Open Green Space just off the Grand Union Canal in Acocks Green. It is accessible from the towpath and has paths running through it that take you to Cambridge Way and Eaton Wood Drive. It is a protected area for local people to enjoy maintained by Birmingham City Council. 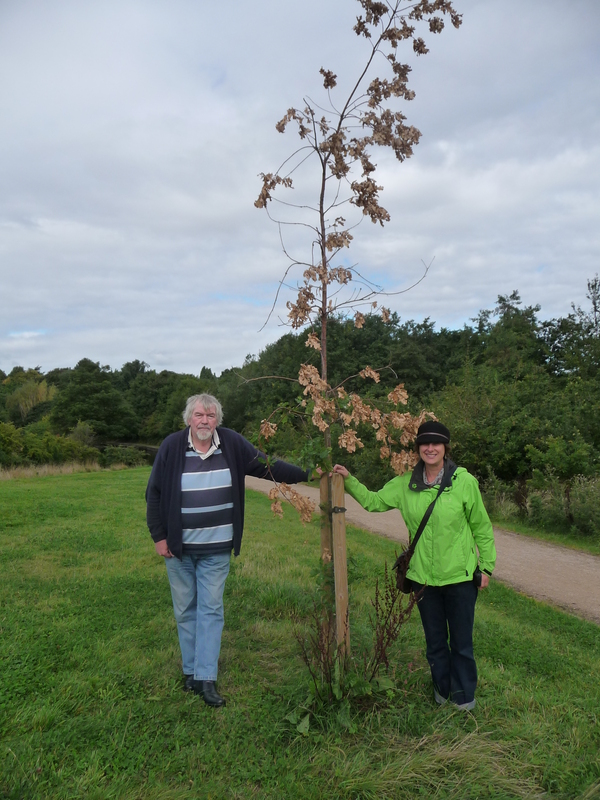 Two years ago the council planted 10 tall oak trees along the edge of the footpaths. Unfortunately because of exceptionally dry weather the trees all died due to lack of rain. Last winter the council replaced the trees, Sadly two trees were vandalised but the others seemed to be doing well. However during the summer some locals, who enjoy walking through the meadow, noticed the oak leaves were growing brown and shrivelling again. Swift action was required. Fortunately the canal is close by so the tree-lovers, including Cottesbrooke Walking Group out on their weekly walk, rallied around and collected water from the canal giving the thirsty trees much needed water! Pat Tarry & Ged Hughes with one of the ‘saved’ trees. Over the dry spells of summer local people watered the trees again and green leaves and new shoots started appearing. This month members of the Neighbourhood Forum arranged a meeting with the Parks Manager Pat Tarry to discuss the future of the trees. Pat, a trained horticulturalist, explained how the trees had died back from the tips, because there wasn’t enough water to reach the height of the trees because the root system had not fully established, but that there was some life in the main trunks of all the trees but one. He has arranged for his team to prune back the dead wood in the near future and next year assures us that, with the exception of one, the trees should come back to full healthy growth. With the restrictions of council budgets, the fact is that volunteers play a vital role in our area. We can all make a positive difference with a little effort. This entry was posted in Events and tagged Acocks Green, Cambridge Way, Cottesbrooke Walking Group, Eaton Wood Drive, Grand Union Canal, Oak Meadow, oak trees, Pat Tarry. Bookmark the permalink. Cheers Julia. It is a nice spot and full of bluebells in the spring. We are lucky to have lots of green space in Acocks Green. Thanks for explaining. Knew nothing about this. What a great idea. Congrats to local volunteers for persevering!